We’ve got all the reaction following Coventry Bears’ narrow 16-20 to Leeds Rhinos of the Super League at the Butts Park Arena last Friday night. That means match analysis and the post-match thoughts of Bears head coach Tom Tsang and the Bears Supporters’ Club Man of the Match, Dante Morley Samuels. 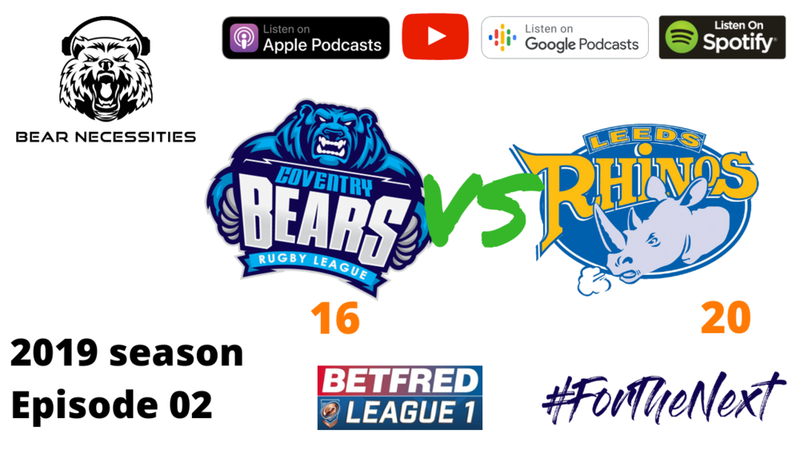 Also, we hear from rugby league journalist and merchandise aficionado Steve Mascord - fresh from having been part of the commentary team for Friday’s official live stream - and we chat to Rhinos CEO Gary Hetherington about his continued support for the Bears’ efforts and his hopes for Leeds in 2019. We live at covbearspodcast.com we’re @covbearspodcast on Twitter and you can subscribe to our show in Apple Podcasts, Spotify, YouTube and many more places too, and we’re sponsored by Yorks Tim.